One-of-a-kind tablet - this describes the first impression after unboxing Sony's Xperia Tablet S. The device looks and feels different from most tablets. 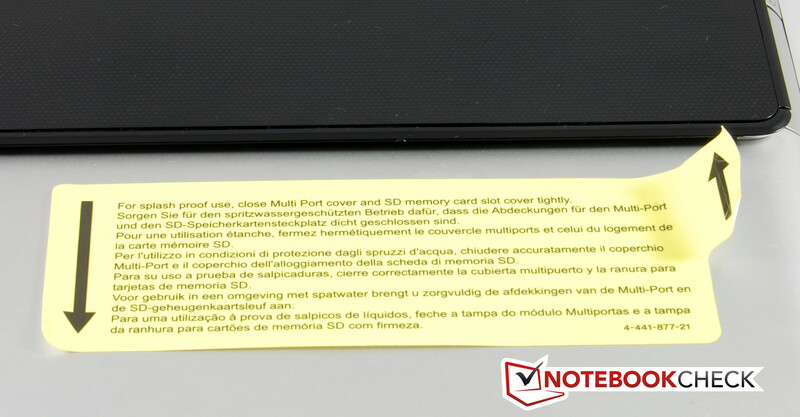 Sony specifies that the Xperia Tablet S is allegedly splash-protected; But more about that in "Case". Even if we have not heard anything from Sony in connection with tablets for a long time, the Xperia Tablet S is not the Japanese manufacturer's first tablet. Two models based on Nvidia's Tegra 2 have been around for a while already. For the first time, Sony now also adds a tablet besides numerous smartphones to its current Xperia series. The specs of our test device with the model number SGPT122DE are: Nvidia Tegra 3, one GB RAM, 9.4-inch screen, 32 GB internal memory and Wi-Fi only. This adds up to a price of 499 Euros (RRP/~$647). The Japanese manufacturer additionally has three other versions available. Two feature a 3G modem and a memory of 16 and 64 GB for which the prices are still unknown. Sony demands 399 Euros (~$517) for the cheapest alternative, which features Wi-Fi and 16 GB. We are curious to see whether Sony can stick out from the strong Tegra 3 competition and how the "splash-protected" feature is noticed in everyday use. It already becomes obvious when unboxing the Xperia Tablet S that Sony has put a lot of thought into the design. 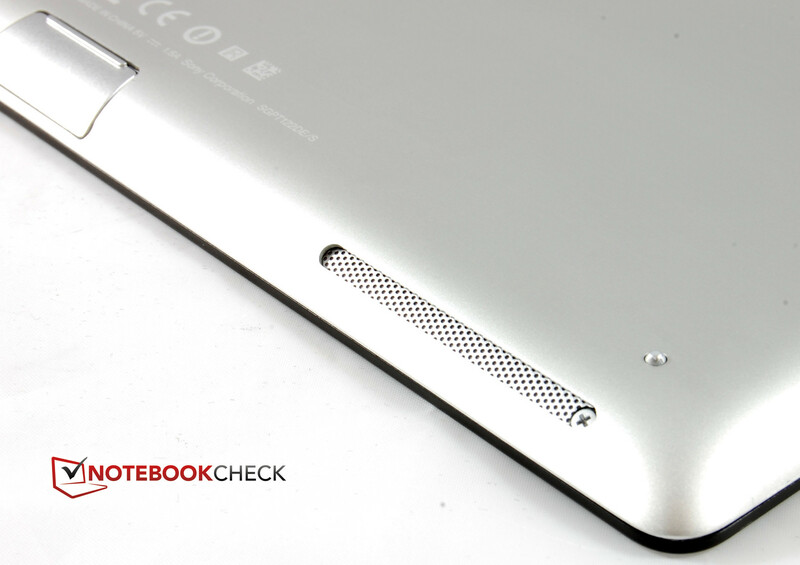 The casing looks and feels different from all other tablets that we have tested. 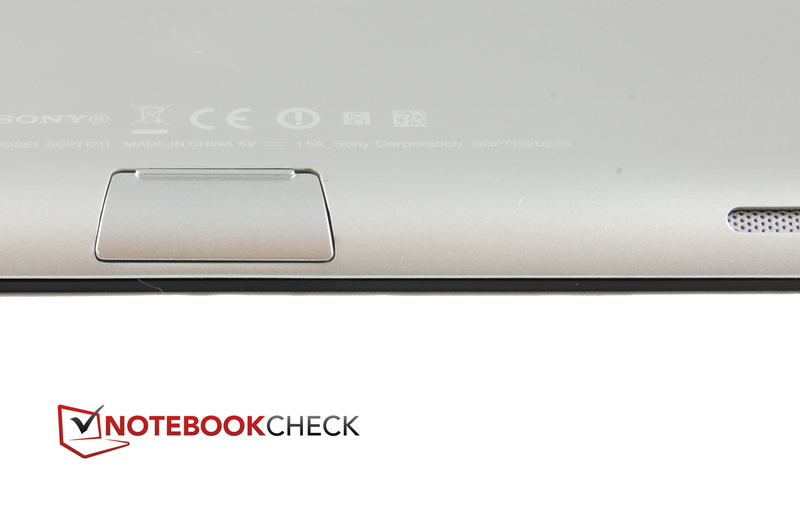 There is a "bulge" on the upper third's rear that looks as if a part of the tablet has been folded back. This bestows Sony's device with a plasticity that tablets normally do not have. Nevertheless, it is identified as a modern tablet at first glance - it is just a bit different. A welcome change in the tablet market, we believe. Sony mostly relies on aluminum. Merely the rear's thicker upper third is covered with roughened piano paint. An edge with a height of approximately three millimeters (0.12 inches) is created due to the different thickness. A bit of getting used to is needed when holding the Xperia tablet. The device is a bit awkward to hold particularly in landscape mode mainly because the weight distribution is unbalanced. However, it is possible to use the tablet comfortably when the "bulge" is placed in your palm. Most of the weight is then in the hand and a lower leverage effect is achieved than with "normal tablets". 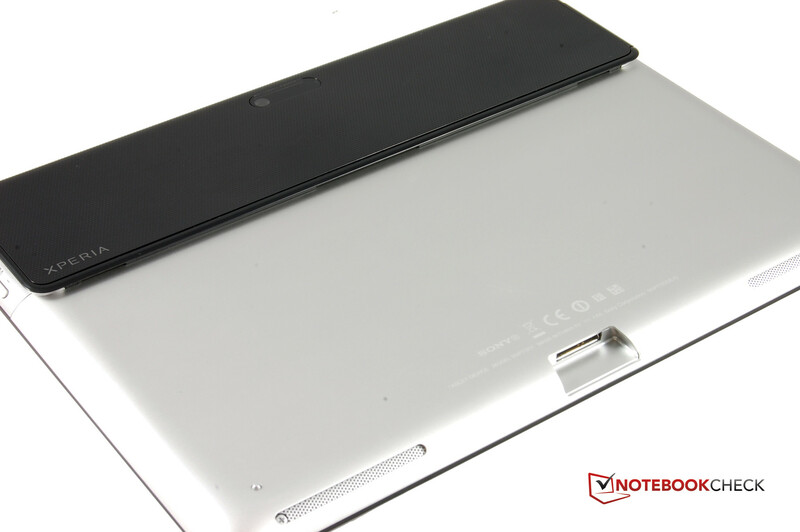 Except for a minor issue, we are satisfied with the workmanship of Sony's Xperia Tablet S. The multipurpose port's flap on the bottom is supposed to keep splashed water away from the device's innards. It does this successfully, providing that it is not lost or misplaced. The flap can be removed completely and is not tethered to the casing with a strip. 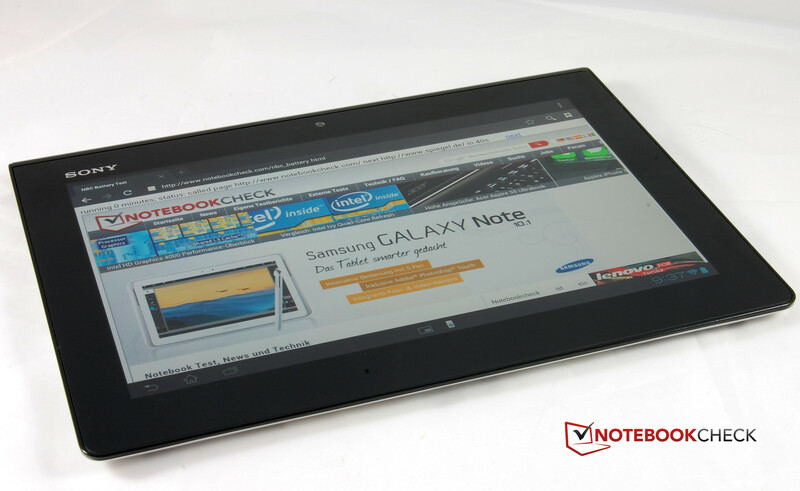 The bulge in the upper third contributes to the tablet's stability. It is very stiff. The Xperia tablet's size is still compact. This is due to the somewhat smaller 9.4-inch screen compared with the premium-range. It is also quite slim with a height of 8.8 millimeters (0.35 inches) and agreeably lightweight with 570 grams (1.26 pounds). One brief remark about the splash-protected casing: There is no danger for the device's electronics in the rain or at the edge of a swimming pool thanks to the waterproof flaps on the multipurpose port and SD card slot. Nevertheless, the device should not be submerged in water because the headphone jack does not have a flap. Even a puddle can get dangerous. Third-party sellers offer corresponding flaps. It would have been great had Sony included this right away. Without it, the "water resistance" idea is not quite complete. There are not many surprises in connectivity. 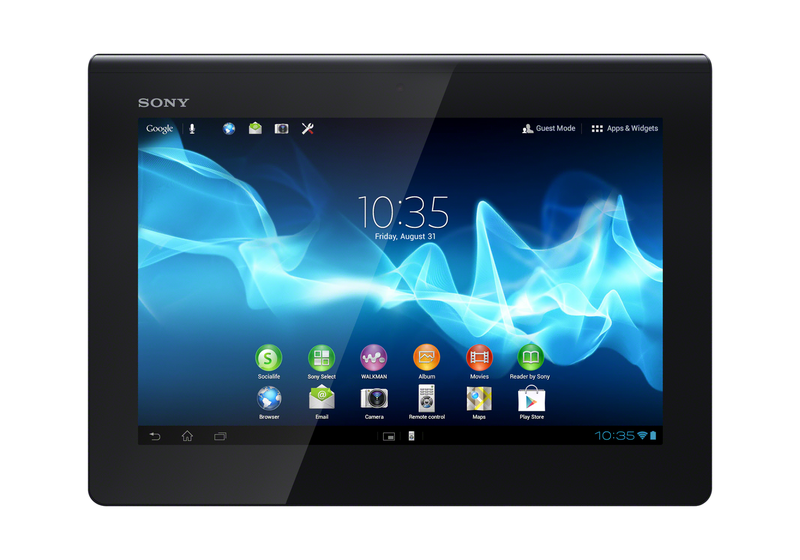 Sony's Xperia Tablet S is based on Nvidia's Tegra 3 quad-core SoC (system on a chip) like so many other up-to-date tablets. All cores clock with 1300 MHz in multi-core operation. The clock frequency climbs to 1400 MHz when only one processing core is needed. A fifth, energy-savings core, is available for undemanding tasks. Nvidia's GeForce ULP GPU is integrated on the SoC, which is also unsurprising. The processor has 1024 MB of working memory available and the internal storage of our SGPT122DE test device is 32 GB. 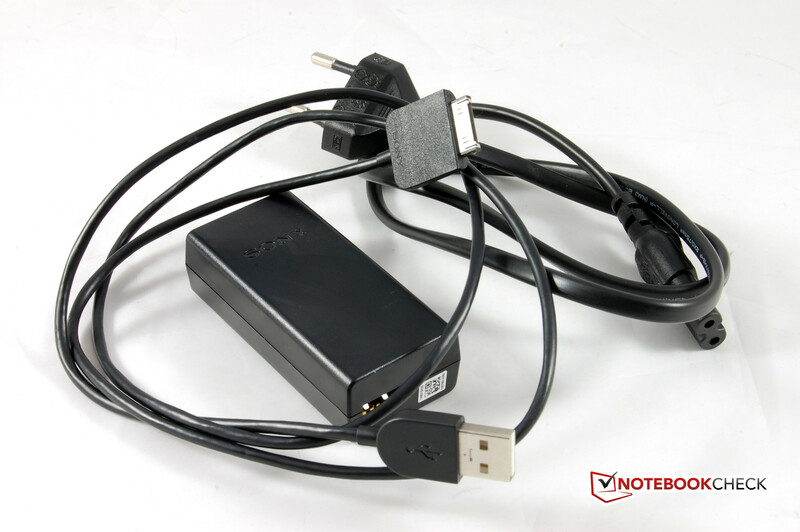 We will deal with the other equipment in the corresponding sections such as the infrared interface that allegedly turns the Xperia Tablet S into a universal remote, however we mention the card reader here. 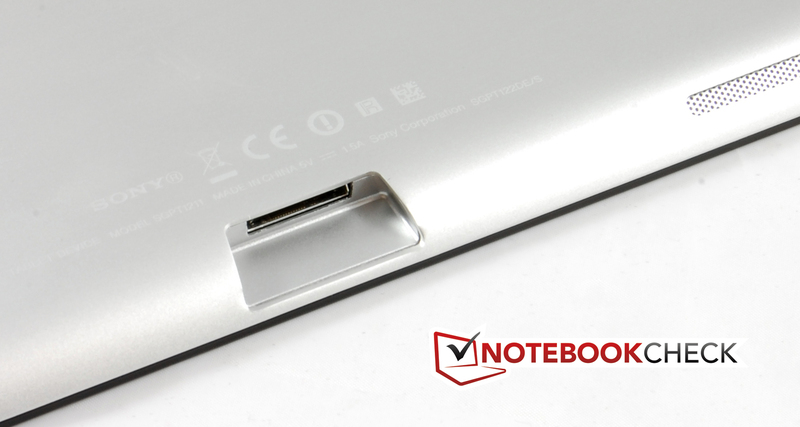 Although virtually all Android tablets sport a card reader, it usually only accepts microSD cards. However, Sony's tablet accepts full-sized SD cards. Thus, the card from a camera can be inserted directly. Besides that, SD cards are a bit cheaper. The placement of controls and interfaces is interesting. Except for the multipurpose port on the case's lower edge, all ports are slightly lowered in the tablet's upper left and right third, (the bulge's area). Nothing juts over the tablet's edge and operating errors are prevented. Although the Android 4.1, aka Jelly Bean, operating system has been available for a few months, Sony delivers its newest tablet with the precursor called Ice Cream Sandwich. Sony cannot yet say if and when an update to Android Jelly Bean might be released. But Android 4.0 is not bad. Google's mobile OS is fully developed and runs stably. We extensively described Android 4's functionality in several previous tests. Sony only modifies the Android system to a minor extent. For example, the keyboard has a slightly different layout. But Sony’s is neither better nor worse than the standard keyboard. Sony integrated a universal remote cleverly. The combination of an infrared sensor and the corresponding app worked flawlessly with both a Sony and a Philips TV. Another great feature is that you can assign gestures or noises to a few functions - e.g. clapping hands or tongue clicking - and open them. A start icon for the remote app is on the screen's lower edge for quick access, beside a second symbol that opens other frequently use applications and tools. The Xperia Tablet S is equipped with innumerable preinstalled apps. Many come from Sony's entertainment network that requires the corresponding account. However, apps like Office Suite and Evernote for memos are also installed. We also liked the Guest Mode. The tablet's owner can specify which apps guests may use. The guest cannot exit the mode without a password. 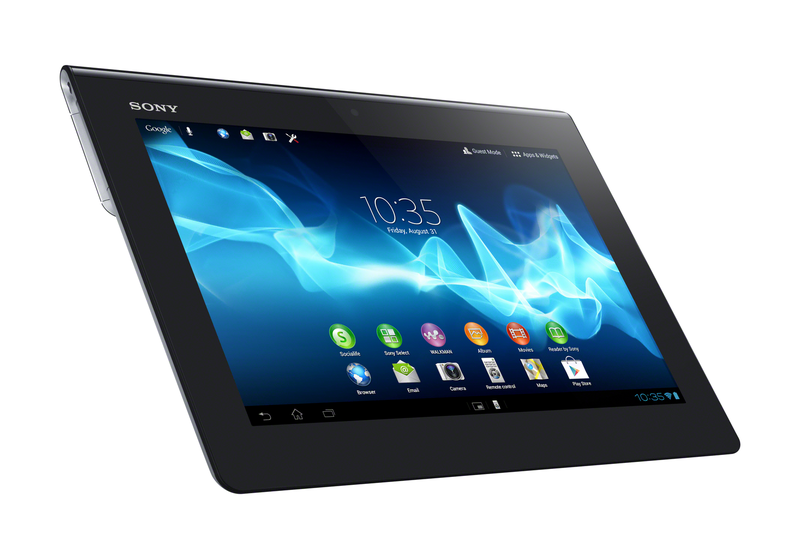 Sony's tablet transmits in 2.4 and 5 GHz networks due to IEEE 802.11 a/b/g/n support. This can be an advantage in heavily loaded networks. However, the Wi-Fi module is not particularly strong. Compared with other tablets, the achievable range is noticeably shorter. 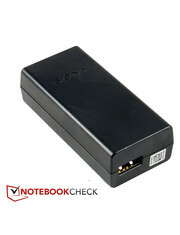 This makes a Wi-Fi repeater necessary in big apartments and houses. Sony also installs the newest Bluetooth version 4.0. 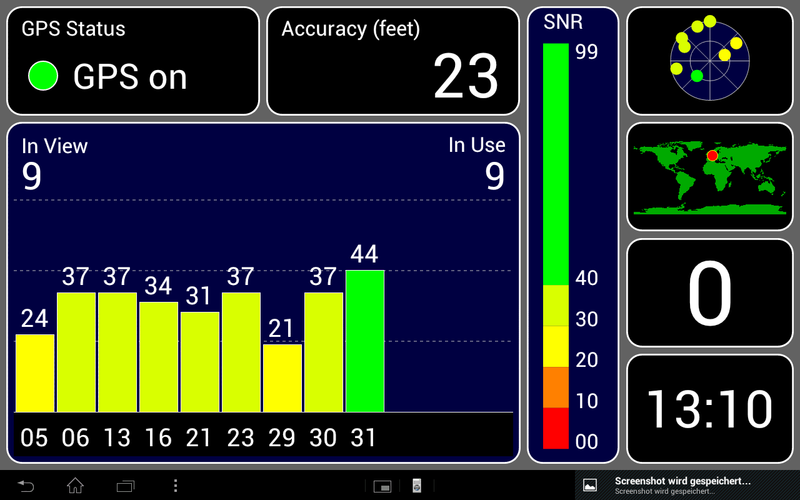 The integrated GPS receiver also does a good job. Initial localization is accomplished in roughly 30 seconds. 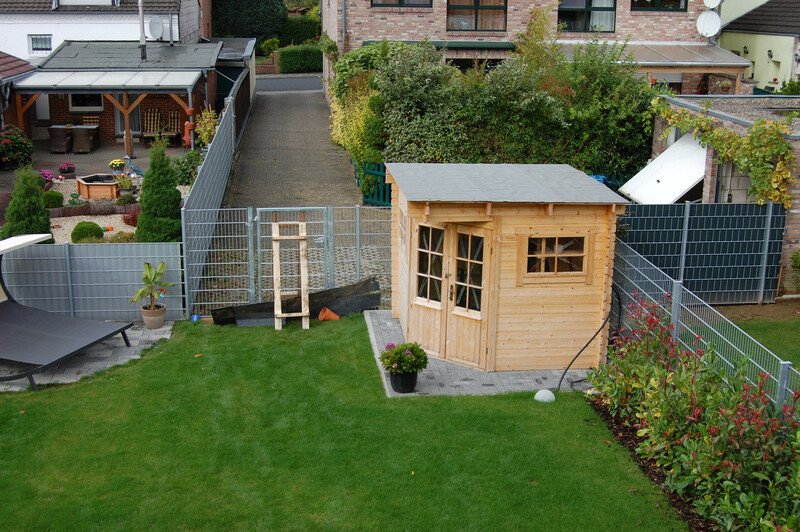 Reception is stable even indoors - providing that you are within reach of a window. We never experienced problems outdoors, not even in the woods. But our model did not feature a 3G module. Two 3G alternatives are listed on Sony's website. As appropriate for a premium-range tablet, Sony's Xperia Tablet S sports two camera modules. The lens centered in the display's upper front edge has a resolution of one mega-pixel. The picture quality can however only be called bad. 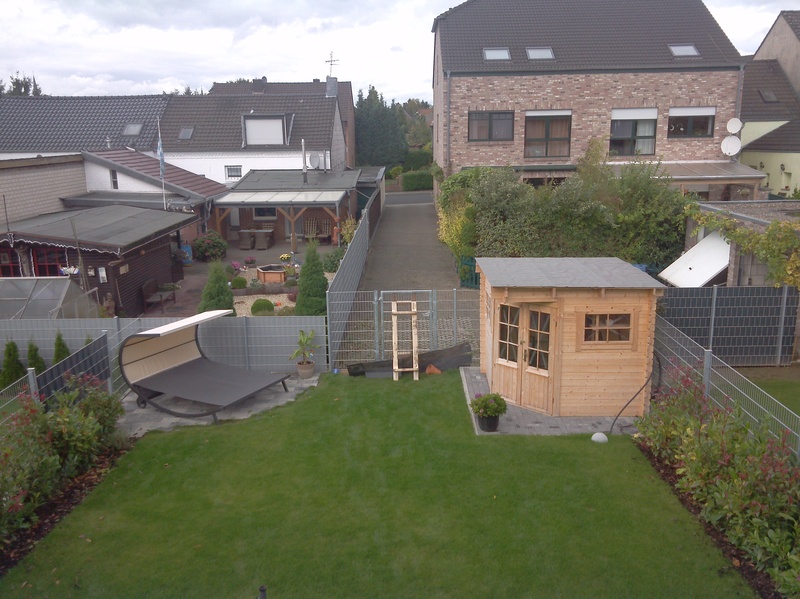 It lacks focus, saturation and the pictures are very noisy on the whole. The quality of video calls via Skype is just sufficient. 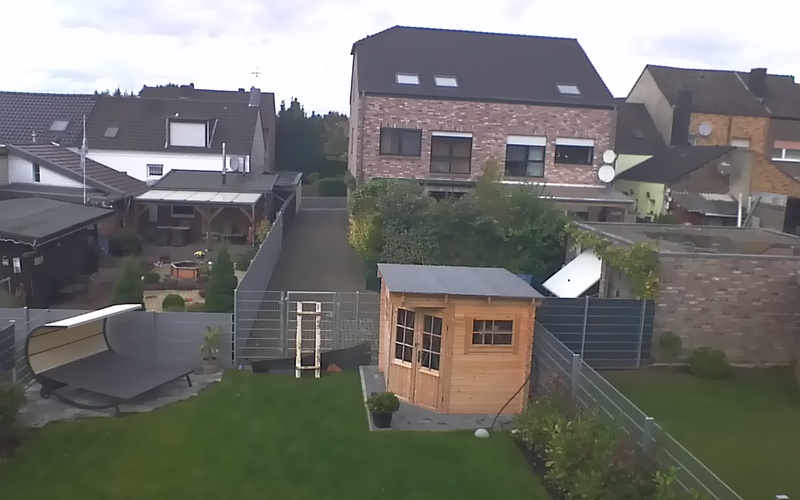 The 8 mega-pixel rear-face HD camera does its job a lot better. Pictures are quite focused but the colors are unfortunately a bit pale and pictures look a bit overexposed. The user can change this manually via the exposure control. This improves the result immediately. The 8 MP lens can also be used quite well as a video camera. It shoots video in Full HD resolution and achieves a good quality. The sensor merely struggles with brightness changes. Playing videos is great fun with Sony's tablet. The colors are brilliant and black areas are saturated. White areas only look overexposed in high brightness settings. Both speakers on the rear's lower edge produce a clear sound and achieve a high volume. However, movie fans have to live without full basses. The sound is even well-heard when the tablet is on a table because the case's front is rounded toward the rear. Nevertheless, we would recommend using the headphone jack - of course only with the matching headphones. Regrettably, there are none included. Sony only includes the most necessary accessories: the PSU, a few instructions and warranty notes. In return, the list of purchasable accessories is long. One of the most interesting parts is likely the multipurpose socket-to-HDMI adapter. It has the part number SGP-HC1 and costs 40 Euros (~$52). Besides that, there are numerous protective sleeves and covers. A screen protector is available for 20 Euros (~$26). Sony also has two docking cradles for 35 Euros (~$45) and 99 Euros (~$128) as well as a tablet holder for 25 Euros (~$32) in its range. Sony includes a 12-month warranty. When the device is registered at Sony within eight weeks after purchase, the warranty is extended an additional 12 months free of charge. Sony could not make any statements about fee-based warranty upgrades at the time of the review. Nvidia's GeForce ULP GPU's gaming suitability is indisputable after numerous tests. This is also true for Sony's Xperia Tablet S. Modern 3D games, such as Need for Speed: Hot Pursuit, ShadowGun or Raging Thunder 2, run absolutely smooth. Moreover, the controls benefit from the sleek touchscreen and the gyroscope's flawless response. Alongside the usable speakers, Sony's tablet is very suitable as a portable game console. 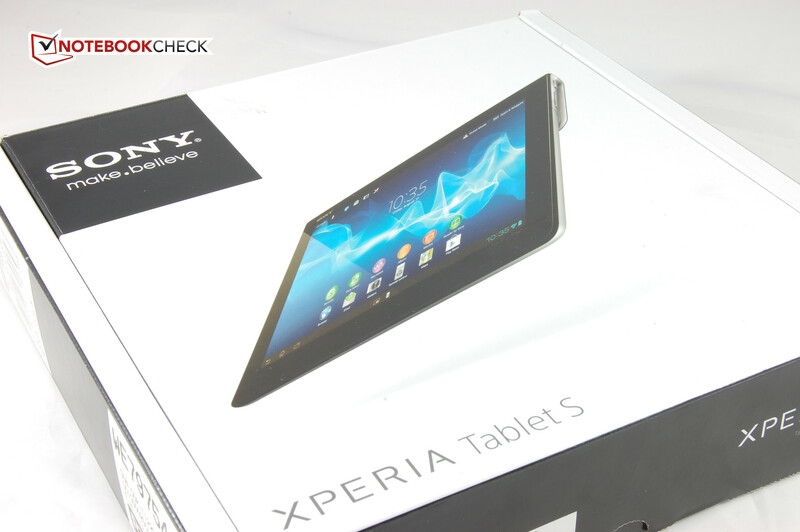 Like most other Android tablets based on Ice Cream Sandwich, Sony's Xperia Tablet S holds no surprises. The touchscreen is also flawless. The finger gently glides over it; it responds immediately and enables very precise navigation. Rotating the screen's content could be a bit faster. The screen turns black for a short moment when turned by 180 degrees. However, it was quite fast in our case. The positioning of the power button and the volume rocker at the upper right edge is well-chosen - at least when the device is held in landscape mode. The SD card slot and headphone jack are on the upper left. 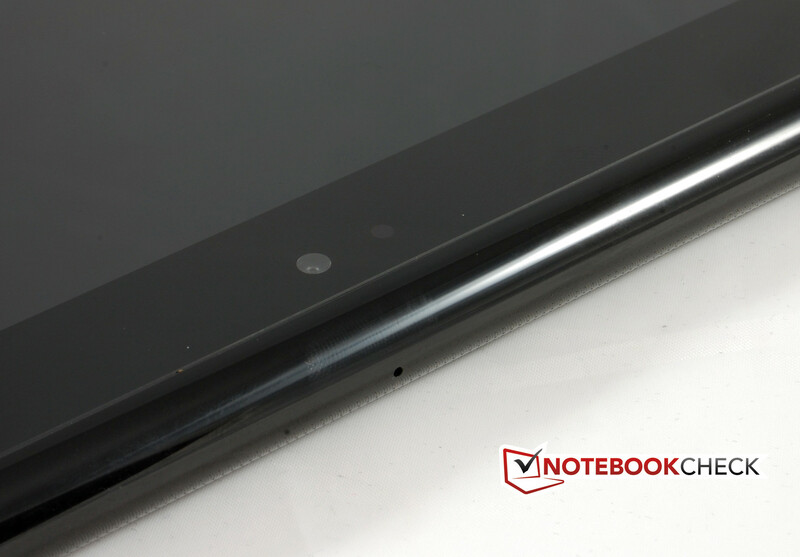 We can only say good things about Sony's Xperia Tablet S in terms of routine use. It is possible to work very smoothly with it. We did not observe annoying jerks or other irregularities, such as program crashes or the like. The device only needs a moment for rendering larger websites. The screen's size of 9.4-inches is rather unusual in the tablet market. The resolution of 1280x800 is practically the standard in current Android tablets. Sony installs an IPS screen that promises both good color reproduction as well as high viewing angle stability. A look at the measured rates taken at nine points shows a maximum brightness ranging between 335 and 395 cd/m2. The brightness is good, but the illumination of 85 percent is not. However, we did not notice any brightness differences in practical use. The screen stands out with quite a good black value of 0.5 cd/m2, which results in a contrast ratio of 758:1. The good contrast and black value are seen in a saturated reproduction of dark colors. The color brilliance is also impressive; color casts were not observed. Overall, the picture quality is compelling. The touchscreen's very sleek surface was already praised. However, it also results in a reflective surface that attracts fingerprints like light attracts moths. Nevertheless, the reflectiveness is not as serious as in some other tablets, e.g. Acer's Iconia Tab A700. Owing to the screen's fairly high brightness, nothing speaks against using Sony's tablet on the go - except direct sunlight and narrow viewing angles. The reflections are very annoying then. 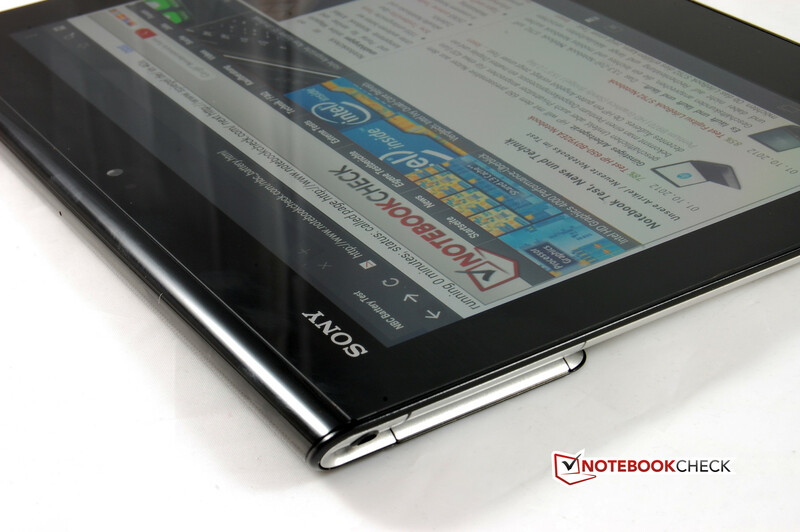 Sony's Xperia Tablet S benefits from its IPS screen in terms of viewing angles. The colors remain stable even in acute viewing angles. Only the contrast diminishes increasingly, especially in vertical viewing angles. However, the device has a lot of elbow room. Overall, a good all-round performance in this chapter. 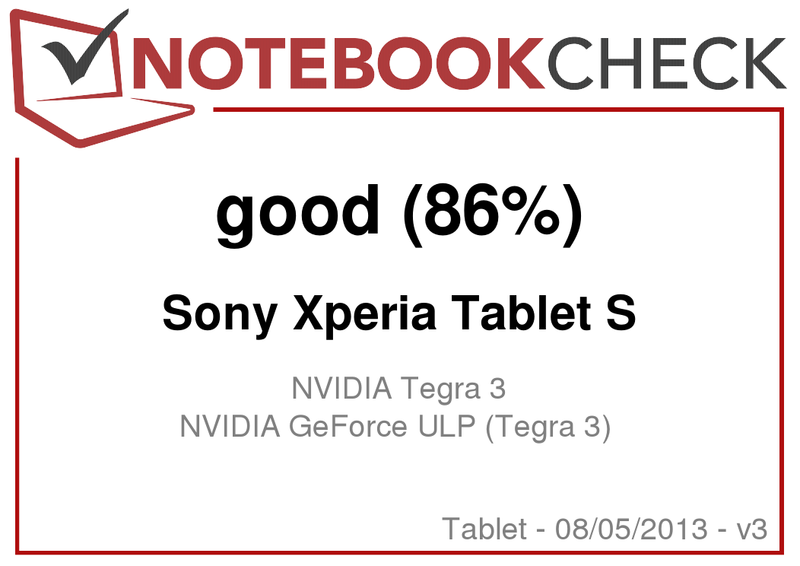 The selected equipment matches the premium claim of Sony's Xperia Tablet S. There is not much that can be done wrong with Nvidia's Tegra 3 platform. The conclusive benchmarks confirm this. Sony's tablet is far-in-front in both the synthetic tests as well as in the browser-based benchmarks. However it cannot quite compete with the strongest devices, the like of Samsung's Galaxy Note 10.1 or Asus' Transformer Pad Infinity TF700T. In return, its graphics performance is at the very front in GL Benchmark 2.5. 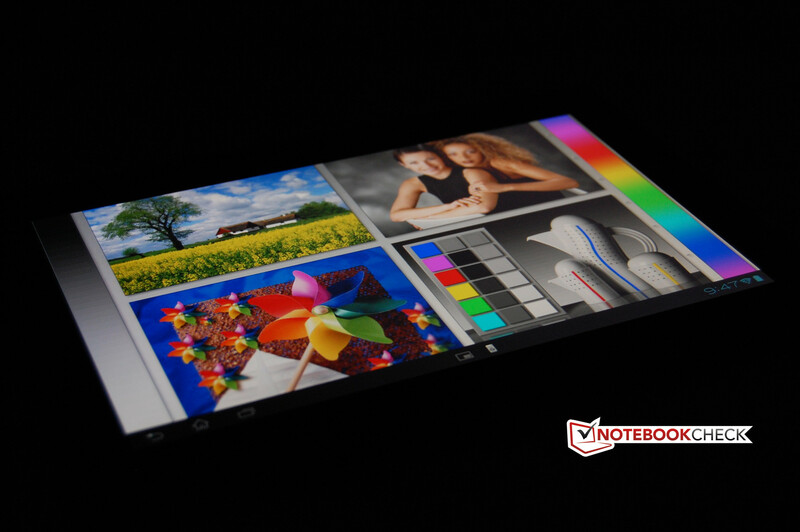 Only Samsung's Galaxy Note 10.1 achieves such a high score in the Android field. Overall, Sony gives a first-rate performance in terms of performance. We do not have any complaints at all about the temperature behavior of Sony's Xperia Tablet S. The case never exceeded 38.6 degrees Celsius at any of the measuring points, even during hours of full load, which is just lukewarm. Sony's tablet stayed cool and the surface temperature was always below 32 degrees in routine use, as will likely almost always be the case. The PSU also never reached a critical range with a maximum of just below 42 degrees. (+) The maximum temperature on the upper side is 37.7 °C / 100 F, compared to the average of 34.8 °C / 95 F, ranging from 22.2 to 51.8 °C for the class Tablet. We expected good battery runtimes from Sony's Xperia Tablet right from the outset considering its fairly economical power consumption. And the Japanese manufacturer's newest tablet member did not let us down. 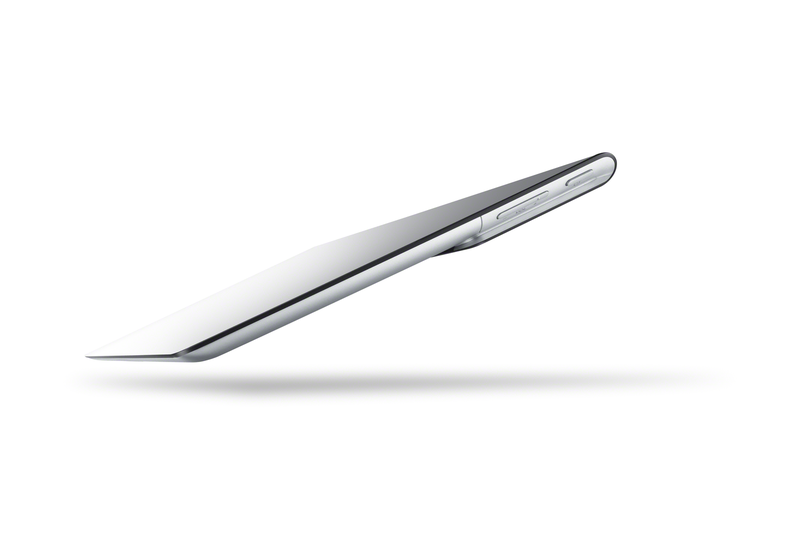 The Xperia tablet is one of the longest lasting of its kind with a maximum runtime of 15:29 hours in the read test performed on minimum brightness. Full load looks pretty much the same: A good three hours are completely within the limits. We would have expected a bit more in the realistic Wi-Fi test where the brightness is set to 150 cd/m2. 6:44 hours are not really a reason for complaint though. The competition does not last much longer here either. However, considering the smaller screen size we would have guessed a quarter of an hour more. Waiting for Sony's new tablet was worthwhile: The Xperia Tablet S brings a welcome change to the tablet market. The Japanese manufacturer relies on the currently popular Tegra 3 chip from Nvidia and there's absolutely nothing wrong with that in view of its known high-performance. Sony also manages to stick out from some strong competition in details. It starts with the case's very high quality build, which is splash-protected and expands the tablets field of use even more. Even the bulge in the tablet's upper third has advantages. The tablet's scratch-sensitive rear does not have direct contact with the table and the slightly unbalanced weight distribution is an advantage when held in one hand. 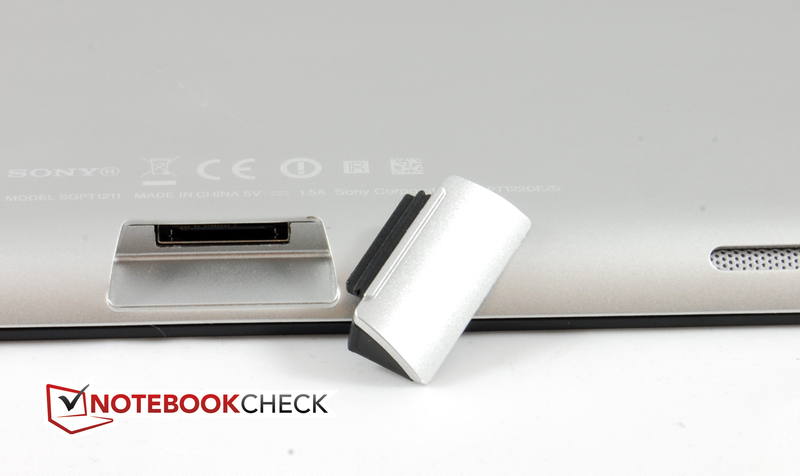 Sony builds a full-sized SD slot into its tablet. The competition only does that in conjunction with docking keyboards, like Asus offers regularly. The screen size of 9.4-inches is also unusual. The smaller screen area is virtually insignificant when compared with the 10-inch competition. The weight of 570 grams (1.26 pounds) is however very pleasing. The screen can score with both a good black value and contrast. The viewing angle stability also fits just like the relatively high performance. However, we have to deal out a bit of criticism despite all the positive points. The cameras: Okay, we'll skip that. The Wi-Fi module's weak transmission bothered us all the more. And that Sony demands 40 Euros (~$52) for a HDMI adapter sounds like moneymaking. On the other hand, the tablet's price of 499 Euros RRP (~$647) is reasonable. Sony ultimately brings a breath of fresh air to the tablet market with its Xperia Tablet S. Nevertheless, you should only surf with it on the Internet despite the splash-protected casing. The box is quite restrained. The PSU is quite compact. But the multipurpose port's flap is not. The SD slot's flap is secured via a plastic strip. The tablet is only splash-protected when the ports are closed with a flap. The controls are also found here. The bulge of contrasting color on the rear is unique. The top does not show any surprises in design. You need three single parts for recharging. The build is very high-end. The Xperia Tablet S looks agreeably different compared with routine tablet designs. Its field of use is extended because it's splash-protected. The Wi-Fi module could be a bit stronger. Sony's Xperia no longer transmitted in areas where we still could easily browse with other tablets. The full-sized SD card slot is a real added value. 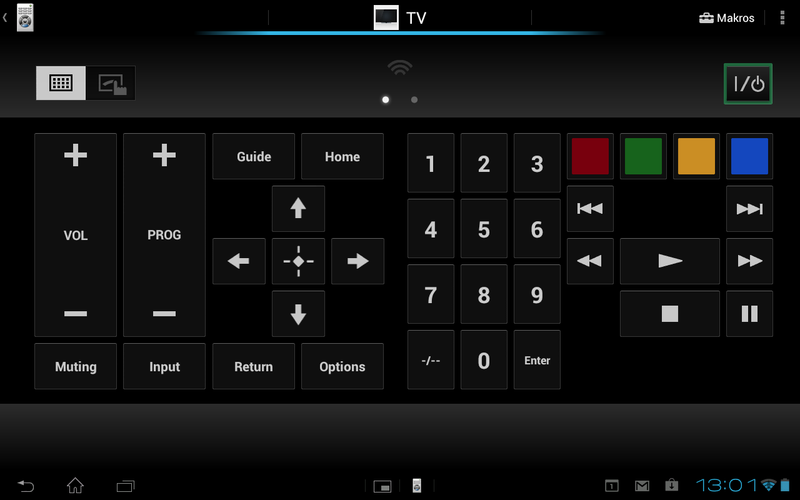 The universal remote function has been implemented well. The competition is vast and mostly features very similar equipment. Besides Apple's iPad 3 and Samsung's Galaxy Note 10.1, the Xperia has to compete with all Tegra 3 contenders. Among them: Fujitsu's Stylistic M532, Asus' Transformer Pad Infinity TF700T, Acer's Iconia Tab A510 and Google's Nexus 7.